Just sittin' here bi(r)ding my time. The robins were very busy last Saturday morning. Between sunrise and 10 AM the male robin and his lady bird built this beautiful gift-of-a-bird's nest on my porch light. Three days later, when the robins were away, I climbed up on one of the porch chairs and took a photo from about six inches away. Oooh! Three beautiful eggs! Now my Lady Bird sits patiently waiting for the eggs to hatch. We can hear her chirping inside the house when she's upset or calling to her mate. They will chirp to each other until she is re-assured. Daddy robin is busy,too. He's taking care of Junior from their previous nest. He's a big baby now: noisy and a handful. Mom is probably grateful she can rest on a second brood out of the rain and hot sun. 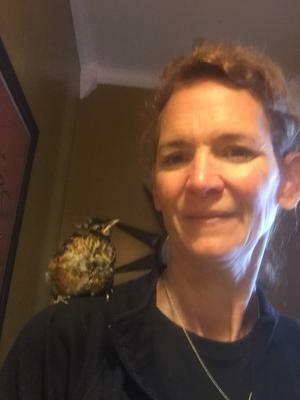 I recently was the care taker of four baby birds, because the nest had to be moved while the house was being painted and they didn't want any part of the nest in their yard, so I took the nest and four baby birds home with me. It is a big responsibility to take care of baby birds and it should be done by someone at the conservation dept. because sadly I lost three of the babies but the larger one of the clutch lived and it was very heart warming to see him fly away up in the tree when I released him. 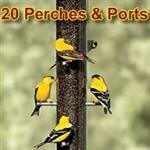 I got on the net and found out what to feed them. It was a birdie smoothie of catfood, berries and water that I put it in the blender and fed it to them with a soda straw. I also gave them water with a soda straw that was mixed with bird vitamins that I purchased at the store. I also purchased nightcrawlers at the store and cut them up and fed them pieces of it. I think the reason the larger one lived was because it had more feathers and kept warmer, I think maybe the smaller ones got to cold, maybe if I had used a hot water bottle they might have made it. But who's to say when it comes to wild life. But a least the cat didn't eat them, I gave them a fighting chance at life. We think that the larger of the birds ( bigfoot) comes back to our yard early in the morning, we heard him and thought we saw him but you know one bird looks like another. 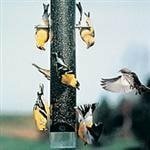 I put seed and water out for him any way. 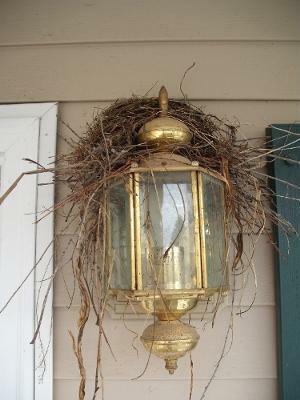 I too, had a Robin build a nest on my Light, my husband removed it, before I could get my camera out..
You won't be using your front door for awhile! She probably does prefer letting Dad take care of Junior! I loved "just bi(r)ding her time" ! Zoom in and open wide. We have learned a lot in three and a half weeks! The nest was built on June 10. 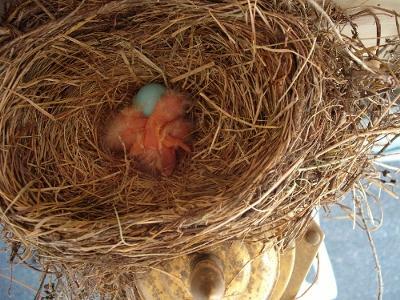 Three eggs were laid soon after, and two babies hatched on June 25. 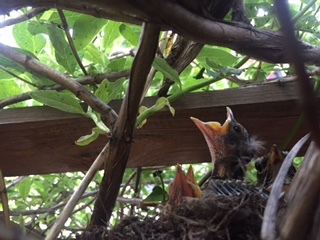 My husband said we should remove the nest: they will make a lot of noise, they will make a mess, and the parents will dive bomb us when we are in the front yard. I held my ground. I wanted to watch what happens! Well, it turns out he was wrong! The only mess so far has been cherry pits(there's an orchard near by). The babies make no noise at all, even when they are feeding. 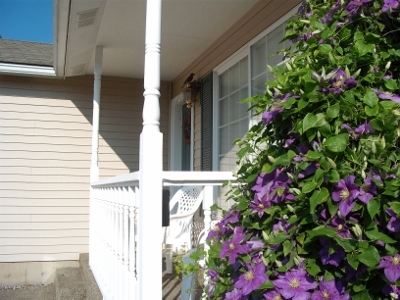 I can work in the flower bed directly in front of the nest while Mom repeatedly flies in and feeds her babies. She sits on the nest and will tolerate me coming in close to take photographs. I can even climb on the porch chair to check on the babies progress when she is away. 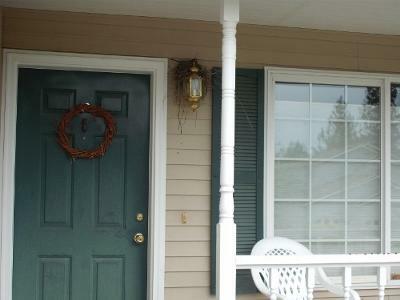 True, we don't use the front door, but what a wonderful gift on my porch! I really appreciate the timeline you provided. Now I know what to expect. Yes, it's a good thing to let the birds nest in your yard. They can tell if the caretakers are willing to share their space. 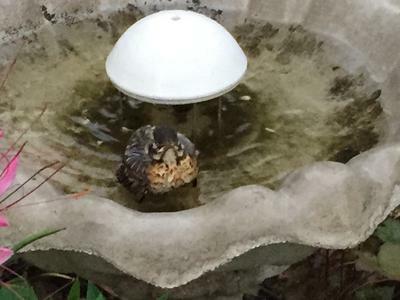 Our birdbath must have been soothing for this Robin! I checked on it quite a few times and it was still sitting there! I know it was humid but it must have really enjoyed the water! But wouldn't it have been hot too? It would have been wet though! Or do you think it landed there and then didn't know how to get out? It's eyes moved looking at me when I was taking the picture! They were very bulging eyes! It was kinda creepy as you usually don't get that close to them! Maybe I should have put in bubbles! Then it could have enjoyed a soothing bubble bath and had smooth feathers too! 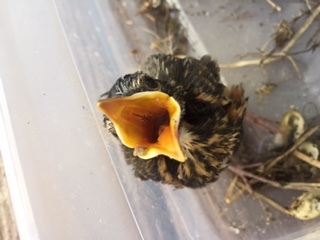 Do you think it was a baby robin? It looked fairly large and all puffed up! What does that mean? And it didn't move but I've heard that they do that. Very curious. Well, I'm sorry to report that this morning it was upside down and gone. It was sad. Maybe I will see it in heaven when I go that it will be all happy and flying around with all the other birds! Yes that's what I'll keep thinking as I give it a proper burial! 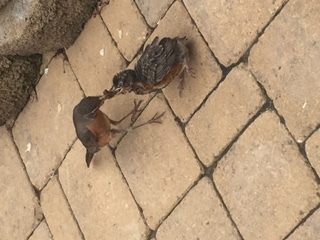 Comments for Baby Robin Extended Bath? Returning at my home after a long period of time ready to start enjoying my back yard after along winter I heard a robins sound. I got back into the house it was already dark anyway. 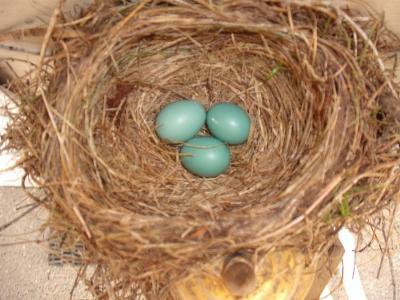 The next morning we discover that next to our door there’s a nest with 4 robins eggs. Now we don’t know what to do because we want to go and enjoy our environment but we’re to concern not to frighten the robin mother since the eggs haven’t hatch yet. The worse fear is that we have few squirrels around and we cannot be there all the time to keep them away. We only hope everything will turn out ok since somewhat the Robin's feels it’s under our protection. As I was reading this, I thought that maybe the poor thing was sick, infected or something. Poor little thing. Outside on my deck I have a pergola and Momma robin built a nest in it. 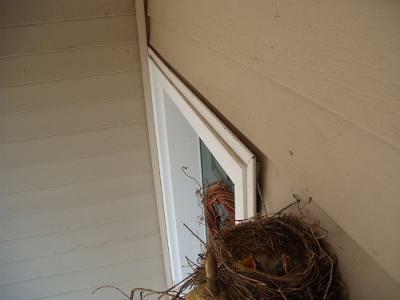 It wasn't the ideal place to build a nest as it was narrow to raise a family of 3. So Momma took care of her young babies in the nest despite its inability to hold her babies. Unfortunately, one fell out of the nest (it was completely formed but without a solid coat of feathers) and it was lying on the deck. I picked it up and my 23 month old grandson watched. It was cold and I knew it was dead; I explained to my curious little grandson it was a baby bird. I wrapped up the baby bird and put it aside to bury later. 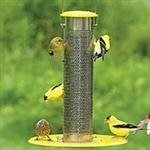 I went inside to wash my hands and I heard my grandson (who just started talking) yelling "bird, bird, bird." Not sure what he saw or was doing I ran outside to him pointing to the ground at another baby who fell out of the nest. I gently picked it up and placed it back up in the nest and it fell out again so I placed it back up in the nest again. It was in the nest but its head was hanging out and I didn't think it was going to be ok. I rechecked the bird that evening to find it in the same position and then again the very next morning. When I looked in the am, it was not in the position I last saw it so I scoured the area to see if it had fallen out of the nest and was lying on the deck and it was nowhere to be found. 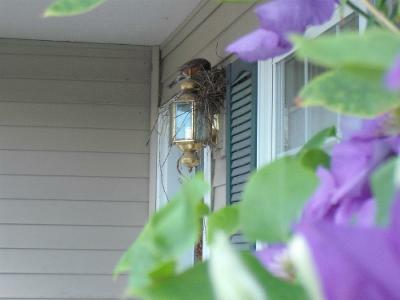 So, I waited and watched as Momma flew into the nest and I saw 2 little heads pop up for Momma to feed them. Whew relieved they both were alive! But it was only a few days later that the nest became too small as the little birds grew and one fell out but Momma would not let me near the nest to put it back. I had no choice but to care for the little one so I got a shoe box and began to care for it myself. As it got bigger it eventually moved out of the shoebox and lived free range on puppy pee pads by my deck door. Momma continued to feed Joe by coming on the deck and meeting the baby to feed it.I would retrieve Joe to come back inside for safekeeping and we did this for days. At night, Joe would sleep as soon as the sun went down and be awake chirping at 0610 to be fed. Joe became a neighborhood icon, everybody was in amazement that I was raising this bird, having it perch on me, and that Momma trusted me enough that she came close to me for its feedings. Everyone who watched could not believe the sight of Momma feeding Joe right in front of their eyes. I left Joe out a few evenings ago for a feeding and he proceeded to fly away into a nearby tree. I tried my best to get him back inside as I feared a ground predator would get him if he stayed out all night. However, despite the rainy night I found Joe (by the sound of his chirp) the next day in a tree a few houses away not far from my home and this am I heard Joe close by under a neighbors deck. I was able to pet him and have him crawl on my hand and he seemed very comfortable with our familiarity. I hope that Joe will stay in the area as he is an important lesson in nature and part of my life. Hey there- just an update on Joe. He continues to thrive and be visible in my backyard. His tail feathers have grown in length and he is quicker on foot as he scurries away from me when I try to get close to him. His distinct chirp lets me know he is nearby and hungry awaiting a feeding from his Momma. What an amazing experience this has been for myself and my neighbors who ask me daily, "have you seen Joe today?" 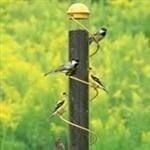 I have taught them to listen for Joe's chirp so they too know his whereabouts. What a great story! Joe is adorable and looking healthy!